Read-out Instrumentation Signpost: Connecting in freezing conditions. CryoCoax is a new division of Intelliconnect Europe specialising in connectors and cable assemblies for Cryogenic Systems. 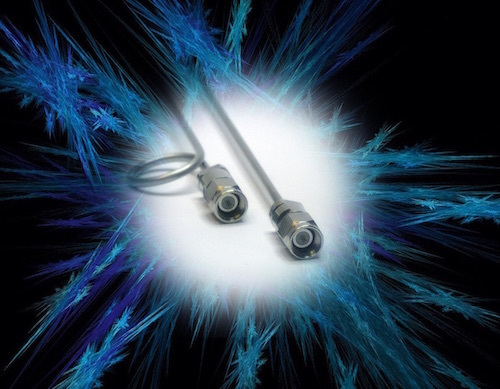 CryoCoax cabling and connectors are used across many applications and industries, those already addressed include measurement and testing, system quantum computing, space and instrumentation. The CryoCoax range of connectors includes sturdily constructed stainless steel interconnects including SMA, SMP, custom designed products and all common connector interfaces. Cables and cable assemblies from CryoCoax are crafted from the finest materials and using the most advanced manufacturing techniques available in the market with test capabilities to 40Ghz. This division designs and manufactures standard, IP68 and glass sealed hermetic adapters and a range of attenuators, from 0dB – 30dB which are specially configured to withstand the lowest temperatures. CryoCoax’s cryogenic cables and components work to beyond 2 K (-271.15°C) and are ideally suited to a wide range of applications including test and measurement, instrumentation, medical and material research and cryogenic systems including dilution refrigerators, superconducting magnet systems, low temperature detector systems, infrared array systems.